Research led by the Universities of St Andrews and Tokyo reveals a new understanding on how to create topological electronic states in solids which could fuel the development of improved materials for fast and energy-efficient electronic devices. The findings could lead to new types of computer chips that could be much more powerful than those found in today’s computers and smart phones. The way in which electrons behave inside a solid is governed by its electronic structure, an intertwined network of ‘bands’ which define the allowed energies and momenta of electrons in the solid. If the right type of bands cross over, this can give rise to interesting, and potentially extremely useful, physical properties of materials. For example, it was recently realised that isolated touching points of these bands can be stabilised by certain crystalline symmetries, creating so-called Dirac fermions in the bulk electronic structure. This allows electrons in the bulk of the crystal to behave as though they were massless particles, effectively a bulk analogue of the atomically-thin material graphene. As well as being an exciting playground for studying fundamental concepts of particles in physics, this can lead to ultra-high mobility of charge carriers, a property that could be used to make extremely good conductors. If the crossing is not protected, another exciting state termed a ‘topological insulator’ can be stabilised. Here, the bulk of the material behaves similarly to a normal electrical insulator, but its surface supports so-called ‘topological surface states’ – additional bands forming protected crossing points containing only electrons localised to the material surface. Practically speaking, these surface states provide a conductive shell around the material bulk, which can remain intact even when the material has defects or damage. An electronic insulator can therefore be transformed into a good conductor at its surface, with potential applications in proposed schemes of electronics that exploit the electron’s spin as well as its charge. Given both the fundamental and practical interest in such systems, there has been enormous recent effort in identifying compounds where these sorts of states can be found. To develop a set of guiding principles towards achieving this, an international team of scientists from the UK, Asia and Europe have combined detailed theoretical modelling with state-of-the-art experimental studies. Their findings, published in the journal Nature Materials (27 November), demonstrate a very general mechanism for generating multiple sets of topological surface states and three-dimensional Dirac fermions all within the same material. The researchers found evidence for these in six separate compounds from the family of layered transition-metal dichalcogenides, a materials system which has been extremely heavily studied due to the wide array of novel physical phases which they host, from unconventional semiconductors to superconductors, and their potential to act as next-generation graphene analogues. Key to the researchers’ findings is a disparity in how electrons can move along different directions of the crystal, coupled with a simple rotational symmetry that can protect some band crossings. 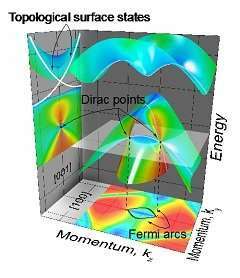 The study showed how this naturally leads to the formation of stacked sets of topological surface states and 3-D Dirac fermions in the transition-metal dichalcogenides. The findings should not be limited to this materials system. Similar starting conditions can be found in many different materials, raising the exciting prospect that the features uncovered here are in fact significantly more common in nature than is typically assumed. The paper Ubiquitous formation of bulk Dirac cones and topological surface states from a single orbital manifold in transition-metal dichalcogenides by M S Bahramy, O J Clark et al is published in the journal Nature Materials.